Responsibility for the financing of the upkeep and maintenance of the church lies entirely with the Parochial Church Council which is a body elected each year at the church’s Annual Meeting from church members on its local electoral roll. It is not commonly realised that local churches receive no automatic financial support from central Church funds or from central or local government. Indeed the local church has to contribute towards the costs of Ministry from its own fundraising. The other major expenses for the church are insurance premiums, which in the case of old buildings are considerable, maintenance of the new church graveyard, and ongoing maintenance, repair and running expenses of the church. The church discharges the responsibility for annual maintenance and on-going expenses through donations from its own congregations, local people and visitors, and through regular fund-raising events. Many of these donations benefit from the Government Gift Aid scheme which enhances donations by tax relief. In addition, for major development and repair projects it relies on grant applications to a variety of grant bodies, as well as donations, sponsorship and legacies. Grants are far from automatic and depend on the type and scale of the need and clear plans and justification for proposed works. A few years ago the church undertook a renewal of the church roof. 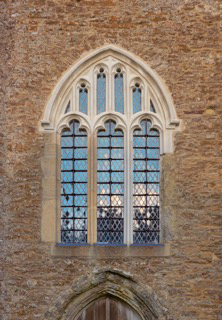 In 2014 Stone Church completed a major repair and renovation of its dilapidated West Tower Window for which it benefitted from around £25,000 in grants, nearly 85% of the costs. In the same year emergency lighting was added to the bell-ringing chamber in the Tower and in 2015 a hearing induction loop was installed for those with hearing impairment. Both were funded by generous donations. In 2016 a telecommunications mast and receptors were installed on the Tower which enables WiFi within the church and makes fast broadband available to local residents whose houses or businesses are within the sight-line of the Tower. This will also provide much needed annual licence rental revenue to help fund ongoing expenses. In the same year our Surveyor/Architect completed a Quinquennial Inspection (a requirement for every 5 years) to identify and make recommendations for any necessary repair or remedial works which will be required. The recommendations are prioritised over the first 2 and 5 years. Fortunately, no major defects have been identified for us and the PCC will be working through the list of works and seeking grants to undertake them. the installation of kitchen and toilet facilities within the building and the grounds. This is a major development for a building currently without water or sewage supply, and involves considerable planning and options work to identify both location and sympathetic design. Funding of this project is anticipated from a combination of grants and a generous legacy from previous church member, Mac Pendleton. As an interim measure a temporary portaloo has been purchased and installed outside the rear of the church. This will provide much-need toilet facilities for events and services at the church until permanent facilities can be provided. Further updates on progress with this and other projects will be posted on this website, and reported in the Outlook on Oxney. For additional information, enquiries about Gift Aid donations, as well as suggestions please contact Churchwardens, Philip Bradshaw on 01233 758 441, or Ken West on 01233 758 323. We welcome offers of specialist expertise in project work and care of buildings.